A tour of the most incredible looking areas of The Lord of the Rings Online that you may have overlooked. These top five beautiful locations may just remind you that LotRO is worth playing. The Lord of the Rings Online is unique in its opportunity to capture the J.R.R. 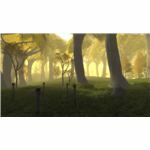 Tolkien world of Middle Earth for use an as online gaming world. World of WarCraft, Everquest... these are games that aspire to mimic the beauty of Middle Earth in their game worlds, but LotRO can actually allow you to visit such well known locales as the city of Bree, the ruins of Weathertopin the Lone Lands, and Rivendell where Elrond lives. This is not to mention the dark depths of the mines of Moria or the treacherous peaks of the Misty Mountains. There is much to enjoy in your visit to Middle Earth, but five locations in particular stand out at the most beautiful and radiant locations in the game world. If you're playing as a hobbit you'll be spending a lot of time in the Shire during the early levels so you've no doubt run across this location. Other characters won't be in the area much, but it's recommended that you walk through and give yourself a personal tour of Bag End. 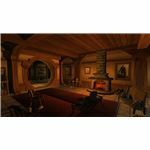 Fans of the books and movies will know it as Bilbo's home in Hobbiton but you'd be surprised how easy it is to miss one of the most iconic homes in fantasy literature in a game of this size. The Shire itself is one of the most beautiful areas in the game but I found Bag End to be more striking than the vast gardens and trees. Aside from having a great look, the attention to detail within is outstanding and serves as a testament to the developer's desire to keep Middle Earth true to the source material. 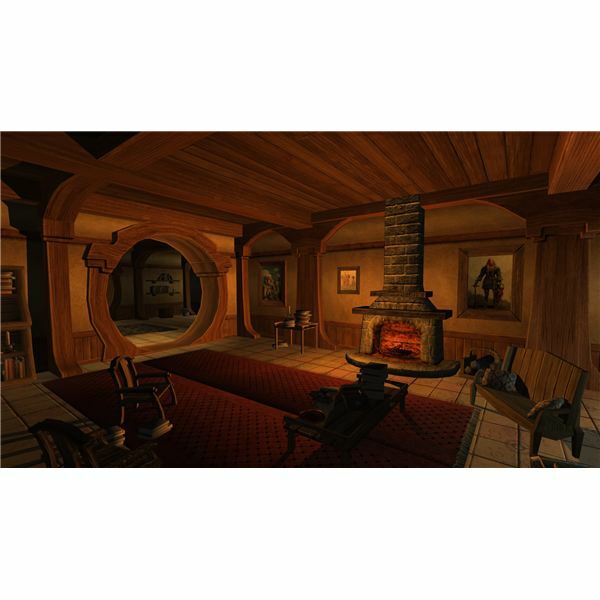 Bag End may be frequently visited, but try not to get caught up in whatever quest you're up to and give the area a good second look. 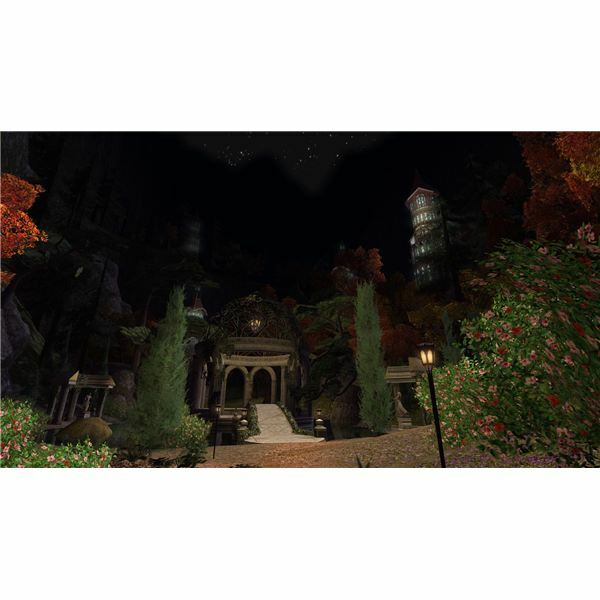 This enchanting location is hidden away just south of the Falls of Imladris in Rivendell. It's accessed through a wooden door leading into what at first appears to be a cave. The player must pass through a narrow tunnel and cross a bridge (featuring its own fantastic view of cavernous surroundings) to reach Imlad Gelair proper. Here the ceiling opens up to the sky. This area is like its own tiny valley hidden in the mountains. Rivendell itself could be said to be more beautiful in appearance, but there's something unique about this location given how tucked away it is. If you're a stickler for completing quests you'll enter it eventually, but I suggest that it is worth looking for. Imlad Gelair can only be accessed if your player character has a friendly reputation with the elves. Evendim was part of the game's first free expansion on June 13, 2007. It offered players a brand new area to explore along with new quest lines and towns. In the books and movies Evendim is never visited, but it has always been a small part of Tolkien's own map of Middle Earth. A massive lake, it gives the game engine considerable opportunity to flex its muscles with water reflection. Seeing it during the day is an absolute must. The surrounding scenery isn't so bad either. Dense forests, a sunken city, and a nearby sandy beach keep the place quite interesting. Yet every time I come to Evendim I can't help but stare into that horizon to find some new beauty in that sea. For those about to quest in the area, be prepared to swim. A lot. Forochel is another area that was not a part of the initial game release, and it also wasn't added with an official expansion release either.A free update presented to the gaming populace for further exploration and adventure, some players may not have bothered to visit Forochel because they were already busy elsewhere. Aside from an epic quest that brings players to the area, there isn't much need to quest here. The area is, instead, an alternative to questing in other high level areas. If you're running through the game with a second character it's a fantastic place to spend time in lieu of Angmar or the Trollshaws. Because this land is more an option than a requirement it's worth pointing out this little area up in the northern shore of Forochel filled with quiet mystery and a unique beauty not found anywhere else in Middle Earth, or in other MMOs for that matter. 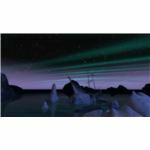 The sunken ship seen against the northern lights of Forochel is a breathtaking sight that should not be missed. When I first started this article I initially wanted to pick specific areas to direct people to visit in an attempt to appreciate LotRO graphics. Yet when I realized I had to pick a location within the forest of Lothlorien it dawned on me that I could not pick any specific spot. All of Lothlorien is fantastic to behold and exceedingly beautiful in the early morning. It is at this time of day that its other name, the golden wood, really rings true. Lothlorien became a part of the game world with the release of the Mines of Moria expansion. It is a reward for players who successfully navigate the treacherous depths of Moria. It cannot be entered until first completing some quests in the game's epic quest line, but once you do they will not ever see a finer example of LotRO radiance.